Covalently immobilize cysteine-peptides (sulfhydryl-containing molecules) for antibody affinity purification with these haloacetyl-activated polyacrylamide beads. The beaded UltraLink Iodoacetyl Resin is a hydrophilic copolymer of polyacrylamide and azlactone having a rigid polymeric structure with high surface area and pore volume. Each azlactone group has been modified to form a 15-atom spacer arm that terminates in an iodoacetyl group, which is capable of reacting with sulfhydryl groups (e.g., side chain of reduced cysteine residues) to covalently immobilize peptide or other sulfhydryl-containing ligands. The bead structure and efficiently coupling chemistry of Iodoacetyl-Activated UltraLink Biosupport results in high protein binding capacity, high linear flow rates, low nonspecific binding and overall superior performance in affinity chromatography. UltraLink Resins are ideal for medium pressure applications such as FPLC. The Micro Peptide Coupling Kit is a microcentrifuge spin column kit for immobilizing small amounts (25 to 250μg) of sulfhydryl-containing peptides (e.g., cysteine-terminated peptides) onto the resin to create a small, reusable affinity column. 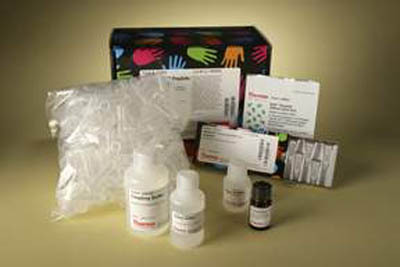 The coupling and affinity purification procedures are optimized for small sample volumes (200 to 300μL). Wash and elution steps are achieved rapidly and efficiently with the convenient microcentrifuge spin columns. Each kit contains sufficient reagents for 10 coupling reactions and 20 affinity purifications. The kit is ideal for immobilizing peptide antigens that contain a terminal cysteine residue for use in purifying specific antibodies from small serum, ascites or culture supernatant samples.